Cause Awareness Ribbon blanket. For instance, use pink for a breast cancer awareness blanket or purple for alzheimer’s disease or lupus. 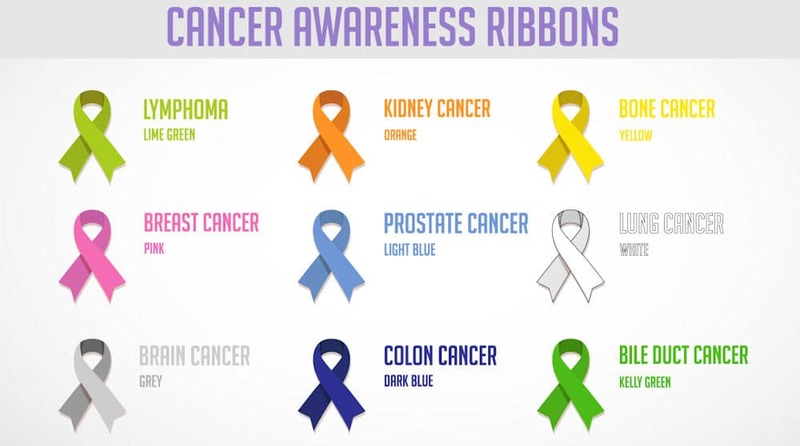 View a full list of all awareness colors HERE. 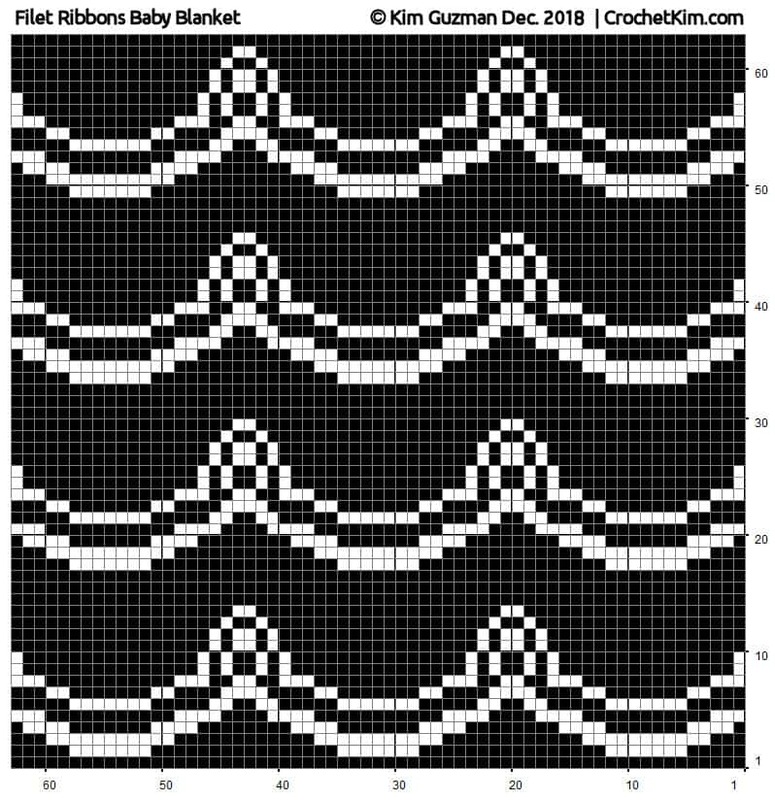 I’ve just shown it as a baby blanket here, but you can easily change the size using the stitch multiples I’ve provided below and a solid color for the ribbon color you would like to represent. 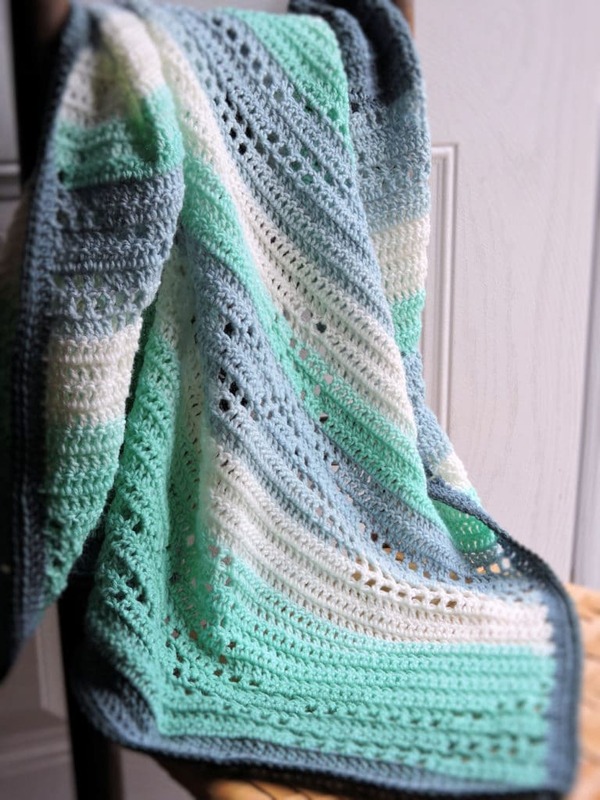 This project is made in filet crochet. Typical filet crochet designs provide an initial chain count and a chart only. For this project, I’m providing both the typical chart and text instructions. I’m hopeful that people will use this project as a learning project. 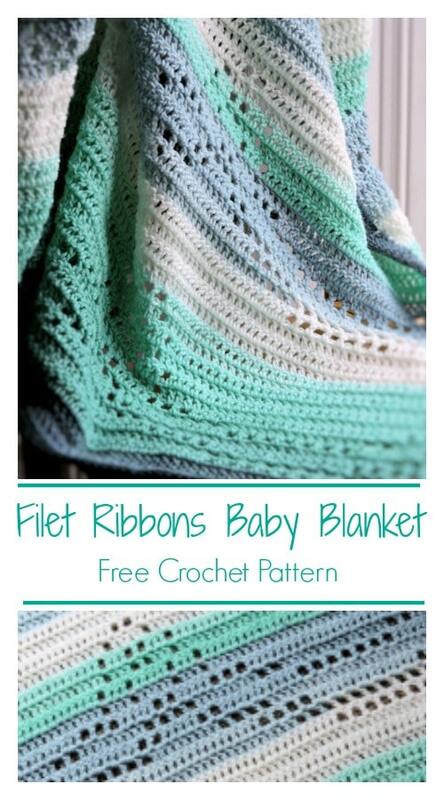 For more filet crochet instruction, I have general filet crochet instructions HERE. 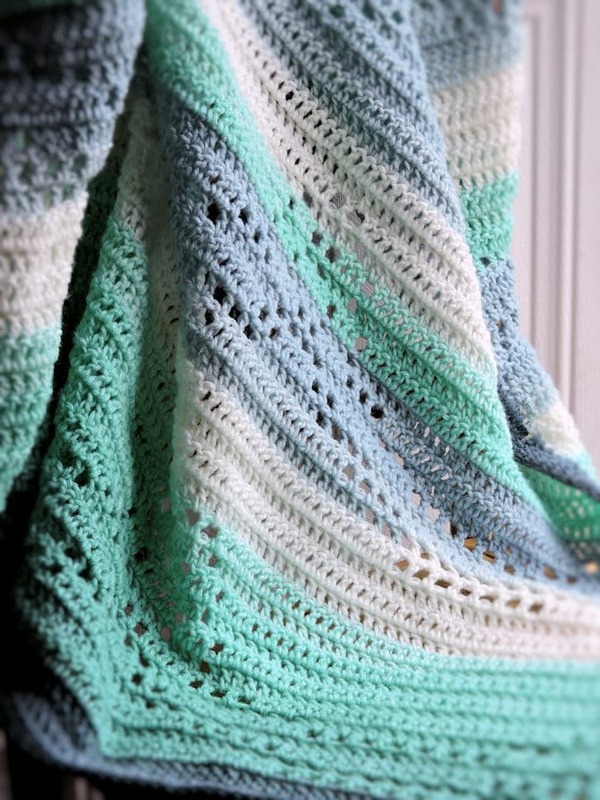 I prefer to use a chain 2 at the beginning of double crochet rows and my pattern is written this way. 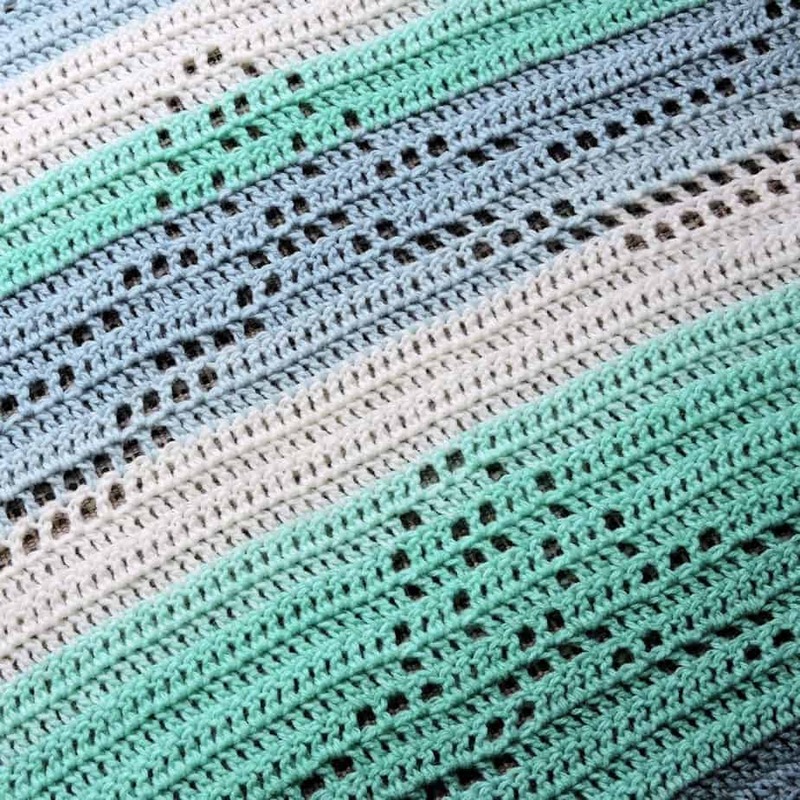 If you prefer to use a chain 3 at the beginning of double crochet rows, feel free to do so here as well. When instructions indicate to work into or to skip a stitch, count the chain 1 space as a stitch too. When instructions indicate to work into a ch-1, work into the space rather than into the chain itself. Row 1: Ch 128, sk 2 ch (counts as first dc here and throughout), dc in each rem ch across, turn: 127 dc. Row 2: Ch 2, sk first dc, dc in next 10 sts, *[ch 1, sk 1 st, dc in next st] 7 times, dc in next 32 sts, rep from * once more, [ch 1, sk 1 st, dc in next st] 7 times, dc in next 10 sts, turn. Row 3: Ch 2, sk first dc, dc in next 6 sts, *[ch 1, sk 1 st, dc in next st] 11 times, dc in next 24 sts, rep from * once more, [ch 1, sk 1 st, dc in next st] 11 times, dc in next 6 sts, turn. Row 4: Ch 2, sk first dc, dc in next 2 sts, *[ch 1, sk 1 st, dc in next st] 4 times, dc in next 14 sts, [ch 1, sk 1 st, dc in next st] 4 times, dc in next 16 sts, rep from * once more, [ch 1, sk 1 st, dc in next st] 4 times, dc in next 14 sts, [ch 1, sk 1 st, dc in next st] 4 times, dc in next 2 sts, turn. Row 5: Ch 3 (counts as first dc and ch 1 here and throughout), sk 2 sts, dc in next st, [ch 1, sk 1 st, dc in next st] 2 times, *dc in next 22 sts, [ch 1, sk 1 st, dc in next st] 4 times, dc in next 8 sts, [ch 1, sk 1 st, dc in next st] 4 times, rep from * once more, dc in next 22 sts, [ch 1, sk 1 st, dc in next st] 3 times, turn. Row 6: Ch 2, sk first dc, *dc in next 10 sts, *[ch 1, sk 1 st, dc in next st] 7 times, dc in next 10 sts, [ch 1, sk 1 st, dc in next st] 2 times, dc in next 4 sts, [ch 1, sk 1 st, dc in next st] 2 times, rep from * once more, dc in next 10 sts, [ch 1, sk 1 st, dc in next st] 7 times, dc in next 10 sts, turn. Row 7: Ch 2, sk first dc, dc in next 6 sts, *[ch 1, sk 1 st, dc in next st] 2 times, dc in next 14 sts, [ch 1, sk 1 st, dc in next st] 2 times, dc in next 8 sts, [ch 1, sk 1 st, dc in next st] 4 times, dc in next 8 sts, rep from * once more, [ch 1, sk 1 st, dc in next st] 2 times, dc in next 14 sts, [ch 1, sk 1 st, dc in next st] 2 times, dc in next 6 sts, turn. Row 8: Ch 3, sk 2 sts, dc in next st, [ch 1, sk 1 st, dc in next st] 2 times, *dc in next 22 sts, [ch 1, sk 1 st, dc in next st] 3 times, dc in next 4 sts, [ch 1, sk 1 st, dc in next st] 2 times, dc in next 4 sts, [ch 1, sk 1 st, dc in next st] 3 times, rep from * once more, dc in next 22 sts, [ch 1, sk 1 st, dc in next st] 3 times, turn. Rows 9-10: Ch 3, sk 2 sts, dc in next st, *dc in next 30 sts, ch 1, sk 1 st, dc in next st, dc in next 2 sts, ch 1, sk 1 st, dc in next st, dc in next 4 sts, ch 1, sk 1 st, dc in next st, dc in next 2 sts, ch 1, sk 1 st, dc in next st, rep from * once more, dc in next 30 sts, ch 1, sk 1 st, dc in next st, turn. Rows 11-12: Ch 2, sk first dc, *dc in next 34 sts, ch 1, sk 1 st, dc in next st, dc in next 2 sts, [ch 1, sk 1 st, dc in next st] 2 times, dc in next 2 sts, ch 1, sk 1 st, dc in next st, rep from * once more, dc in next 34 sts, turn. Row 13: Ch 2, sk first dc, *dc in next 36 sts, ch 1, sk 1 st, dc in next st, dc in next 4 sts, ch 1, sk 1 st, dc in next st, rep from * once more, dc in next 36 sts, turn. Row 14: Ch 2, sk first dc, *dc in next 38 sts, [ch 1, sk 1 st, dc in next st] 2 times, rep from * once more, dc in next 38 sts, turn. Rows 15-17: Ch 2, sk first dc, dc in each rem st, turn: 127 dc. Rows 18-49: Rep rows 2-17 twice more. Rows 50-63: Rep rows 2-15. Do not fasten off. Begin working in rounds. Round 1: Ch 2 (counts as dc), 4 dc in same st, dc evenly along sides of rows, 5 dc at next corner, dc evenly across bottom of blanket, 5 dc at next corner, dc evenly along sides of rows, 5 dc at next corner, dc across top, sl st to top of beg ch-2. Round 2: Ch 1, working in back loops only, sc in each dc with 3 sc in each center dc of 5-dc corner, sl st to first sc, fasten off.